Explore our Barbados surfing holiday destinations. Barbados is famous for it's blue skies, crystal clear water and year round sunshine. What you may not know is the fact that it has the Caribbeans best surf. Californian surfers introduced Barbados to Surfing in the mid 60's and the local Bajans picked it up very quickly. In 1968 the Barbados Surfing Association was set up and the country sent a team to compete in the World Championships the same year. A few surf shops started to pop up in the 1970's and locals could now easily get their equipment nearby instead of sourcing it from abroad. Around about the same time the islands most famous surf break, Soup Bowl, began to be featured in various surf magazines and word got out of how great a surf destination Barbados was. Since the mid 80's the country has gone on to host major international surf competitions including the Independence Surf Festival and the Soup Bowl Junior Pro. Barbados has grown to become a true surfers paradise, and the laid back nature of the people makes it all the more welcoming. What's the surf like in Barbados? Although definitely a year round destination, especially on the East coast, the most consistent time to go on a surf vacation to Barbados is from October to March. Peak tourist season (non surfers!) is December to March, mostly Americans and Europeans trying to get some winter sun. The island has 97km of coastline and is only 22km across so no matter where you stay you can drive around and easily check out the surf along the different coastlines. What we love about a surf holidays in Barbados is that it offers something for everyone. A mixed variety of waves for every level, amazing hotels & accommodation, and lots to do aside from surfing also. Most of the islands spots break onto flat Coral reefs or beautiful sandy beaches so while it has world class big wave spots like Soup Bowl, a surfing holiday Barbados best suit beginner & intermediate surfers looking for long fun waves, a chilled out beach vibe and tropical island surrounds. As it is a small island property is at a premium, this means more overpriced hotels than Barbados Surf Camps, however we do have some great options that dont break the bank and are right by the surf. The East coast has the most consistent surf in Barbados and has breaks to suit all standards. The islands most famous surf spot, Soup Bowl, is located in the small town of Bathsheba. A fishing village with a population of 5,000, and a nice change from the glitz of the 5 star resorts on other parts of the island! Soup Bowls is a super fast right hand barreling over reef. Strong trade winds bring consistent year round swell to the East coast. 10 minutes walk northwards is Sand Bank, a mellow beach break and perfect learn to surf spot. The area is a perfect place to relax and get away from it all. It's also a short drive to the islands tropical forest land and underground caves. 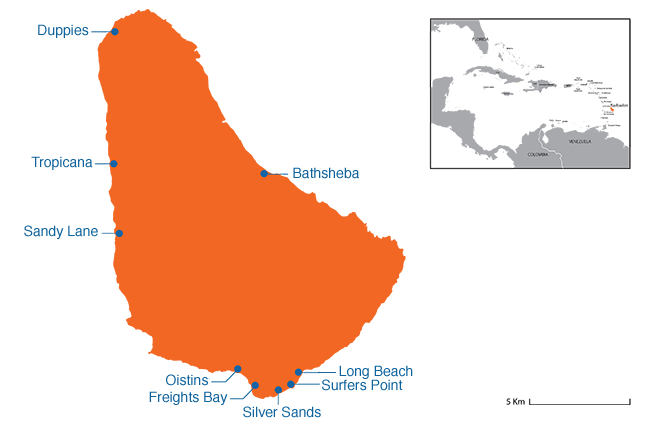 The South part of the island is best known for beginner and Intermediate waves such as Freights, Surfers Point, Long Beach and Silver Sands. Freights is a fantastic intermediate break, often producing long soft barrels. The South has a mix of open white sandy beaches and also small beautiful bays. It's the best area to stay if you want to be surfing Barbados and close to the nightlife/surf hang outs. The area has the best variety of accommodation and Barbados Surf Camps on the island. Home to Tropicana, probably the island's second highest profile wave after Soup Bowl. The wave is a classic left break producing hollow barrels over sharp reef. The West coast is less consistent than the East with calmer beaches which work best from December to March. Sandy Lane further South is a very good intermediate spot. The West has a bit of a Beverley Hills style about it with a mix of glitzy beach-front mansions, high end shops, golf courses and pristine beaches but it also has small villages giving it a nice blend and adding a local feel also. The North is more rugged than the rest of the island. It is dotted with small bays rather than long open beaches. The World class wave Duppies, is on the northwest coast, a fast right that breaks quite far out. Close by is Maycocks, a bit of a mission to get to, but you will be rewarded with fun righthanders that suit all surf levels. In our more detailed guide to Barbados surf spots, we divide the different breaks into Advanced, Intermediate & Beginner surf level. Barbados often gets labeled as having the world's best beach weather. The water never drops below 25°C so you never need to think about wetsuits! It is outside of the Atlantic hurricane belt so never gets big storms and rarely rains. It has year round temperature of almost 30°C and the trade winds bring a nice breeze so it never feels too hot. In a word: Paradise! 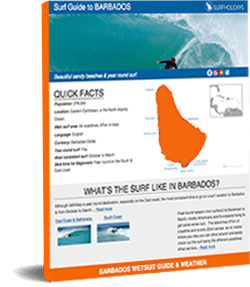 For a more detailed look at when & where to surf in Barbados for your surf level use our Surf Trip Finder. Then browse each destination to discover our great choice of accommodation and lessons and surf the best surf beaches in Barbados! Book your surf holiday online now!